After several days of strong north-easterlies, rain and low temperatures, conditions returned to normal for the first day of racing run by JK Jadro Koper. The north-easterly Bora was still in place, but it was very unstable with shifts of 40-50 degrees all day long. Race 1 got away first time and was decided on the first left shift on the first beat, leaving those on the right struggling to catch up. Cameron Tweedle led the group on the left and just rounded ahead of the current European U23 champion, Nils Theuninck and Jock Calvert. The battled continued on the second upwind with Theuninck getting the better of Tweedle to round ahead and lead down to the finish. But these two separated from the fleet and had a comfortable lead on the chasing pack, which was really tight on the last downwind. Eventually Teply rounded the gate ahead to take third. The second race took several hours to get away, the first attempt being abandoned half way up the first beat because of another large windshift. It was finally started after a long wait and then two general recalls. The wind was fighting from left to right with huge pressure changes to match and boats played snakes and ladders with the changes. 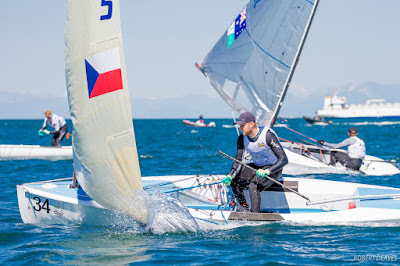 Defending champion, Oskari Muhonen played the game perfectly though and rounded the top mark from the left, where the entre group had freed off to get down to the upwind mark in another big shift. He was never headed and sailed away for a huge win. Mikhail Iatsun rounded second, but was soon run down by Teply and then by Guillaume Boisard. Defending champion, Muhonen, had the opposite fortunes.